BetterNouveau is organizing a promising workshop about circuit milling with Roland iModela in Turin. Massimo is going to walk you around milling your own shield. […] you’ll learn to design and create your very own Arduino shield (‘shields’ are boards that can be plugged on top of the Arduino extending its capabilities). 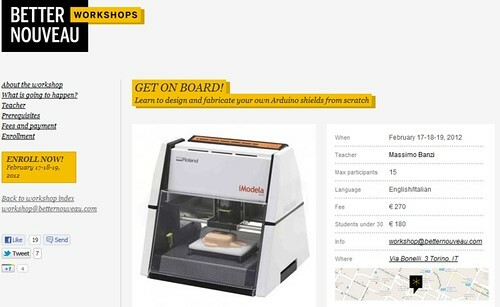 We’ll start from schematics, create the layout and make real prototypes on-site: become a pro Arduino user and learn to design circuits with the Eagle PCB software and make your own Arduino Shields using the Roland iModela desktop milling machine. D.I.Y shields are the best way to move your project from a breadboard-based approach into a professional prototype. The Workshop is held on February 17-18-19. Oh please, make a video tutorial out of your workshop. Turin is way to far. Its a request, please make a Video for this workshop so that everyone who wont be able to attend can at least watch this. Would really appreciate a live webcast of the seminar! Not possible for me to travel to Turin unless I find a rich dead uncle who can leave a huge inheritance. On a serious note, the webcast would be a great help since I am also struggling to develop my own pcbs at home.